Every week, researchers at Unanimous AI gather a swarm of NHL fans and enthusiasts to forecast the latest matchups. 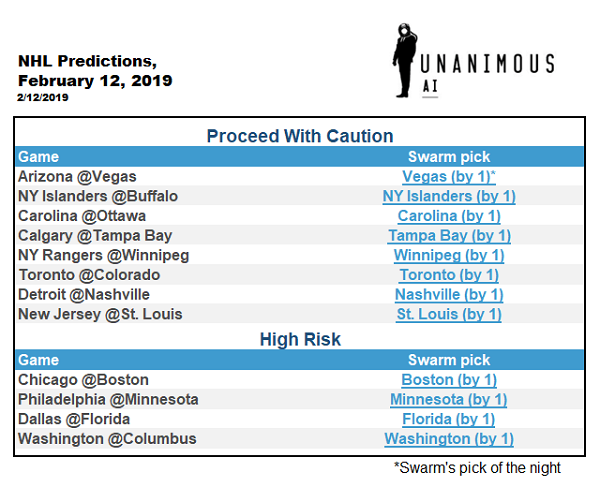 The NHL Swarm uses a new technology called Swarm AI to combine their wisdom, intuition, and experience into an optimized forecast that often outperforms even the best experts on record. You can see the NHL Swarm’s latest forecast below, or see a long-term study of its results HERE.